Feline abdominal ultrasound: how to know what's going on inside your cat? Feline abdominal ultrasound. What is it? Why did my vet recommend it? What does it involve? Let’s consider this. Sometimes cats just don’t feel well. Maybe the cause is obvious, such as an injury or fight wound abscess. More often it’s not, such as when your cat just isn’t eating with the usual gusto. And sometimes the doctor can feel that something isn’t right, such as when we feel a lump deep inside that normally shouldn’t be there. So what can we do to find out more about what’s going on inside your cat, where we can’t see during a regular examination? Recently, our very own Dr. Melissa Mustillo attended a focused training seminar to expand her knowledge and skill for performing feline abdominal ultrasound exams. 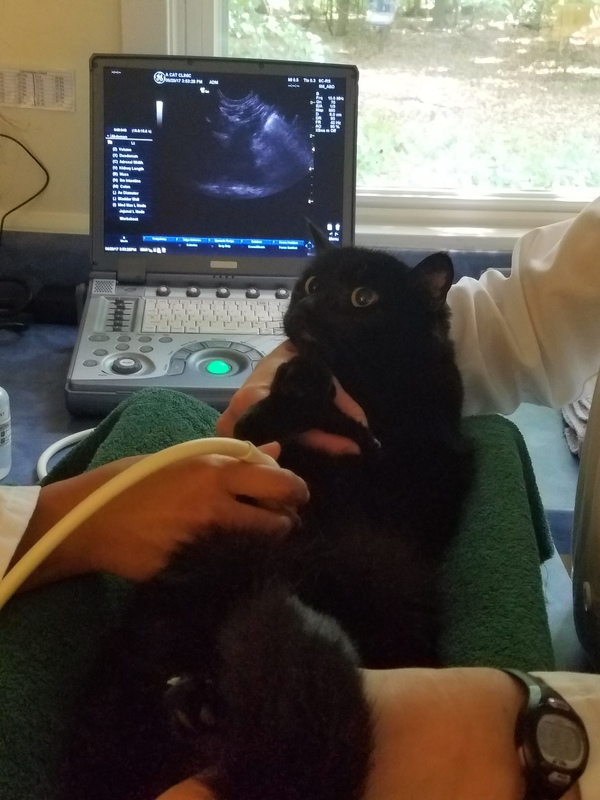 She is now offering complete ultrasound exams of the abdomen to serve as an important diagnostic step for sick cats or cats requiring a full medical workup. What is a feline abdominal ultrasound? An abdominal ultrasound exam is a noninvasive, non-painful procedure to evaluate internal organs. You know, those important things that we need to live, like our kidneys, liver, lymph nodes and intestines. In people, it is often used to show pregnancy; most of us have seen a fuzzy, strange black-and-white picture of someone’s new baby! Ultrasound uses sound waves to be able to see inside organs and to evaluate their size, shape, and texture. The texture and measurement of organs can help diagnose diseases such as inflammatory bowel disease. Ultrasound also allows the doctor to look for the presence of masses that may indicate cancer; free fluid in the abdomen; and to see inside the bladder to look for bladder stones. An abdominal ultrasound exam is indicated to evaluate cats with abdominal symptoms such as vomiting, diarrhea, straining to urinate or urinating blood. This test can also be helpful in cases of unexplained fever, loss of appetite or weight loss. An abdominal ultrasound exam is often done if an x-ray, blood tests, or physical examination indicate a problem with an abdominal organ such as the liver, kidneys, or pancreas. What happens when your cat has an abdominal ultrasound exam performed? When your kitty has an abdominal ultrasound, he/she will most likely need to spend part of the morning with us. Your cat will need to be fasted, meaning no food for 8-12 hours prior to the exam. This is the hardest part for your kitty – no breakfast! Water and medications are still OK. A small patch of fur will need to be shaved on your cat’s belly to allow good contact with the ultrasound probe and the skin. The probe is the tool that emits the sound waves and receives the images. It looks like a stick with a rounded head attached to a cord. Alcohol and ultrasound gel are applied to the skin to also allow good skin contact. Once the scan is finished, we will clean up your kitty so no residue remains. During the scan, kitty will be placed on their back in our soft padded trough, to make things as comfortable as possible. Anesthesia is not needed, but very anxious cats may benefit from a mild sedative to help them relax and hold still. The scan takes about 20-30 minutes to complete. When the ultrasound exam is finished, your cat will be offered something yummy to eat as soon as possible! Does ultrasound always give an answer to why your cat is sick? Ultrasound is an excellent and safe diagnostic tool. However, as with all diagnostic tests, it is not 100% perfect. Based on the scan, additional tests may be recommended. Sometimes we can’t find anything wrong, which might be a good thing. And sometimes we need more information than just the ultrasound alone provides. If we find a mass or fluid, we may have to draw a sample for cytology (evaluating the cells), or we may recommend endoscopy (actually looking inside the intestines with a special “scope”), and sometimes even surgery. Obviously, your veterinarian’s evaluation of your cat’s health is the first step in trying to determine what’s wrong when things just aren’t right. But hopefully if a feline abdominal ultrasound is suggested as a next step, you have a little understanding of how that can help.